Housing shortages across the state of Minnesota, as well as in many areas of the country, have hit historic levels and show signs of worsening. As this crisis escalates, Baby Boomers continue to age out of the workforce; deepening labor shortages that have already challenged employers in every industry. Employers need a qualified labor force to grow their businesses, but employees simply cannot find affordable housing within a reasonable commuting distance. While developers focus the insatiable demand for luxury housing, employers can partner with the public sector to meet their labor demands by satisfying the public’s need for affordable housing supply. Many frontline jobs simply will not pay salaries that make luxury rentals attainable. In the current market, real estate developers do not see yields large enough to justify investment in affordable supply. However, employers would not be investing in housing for the primary purpose of double digit cash-on-cash returns. Therefore, the LIHTC incentive provides a viable method for employers to finance workforce housing. 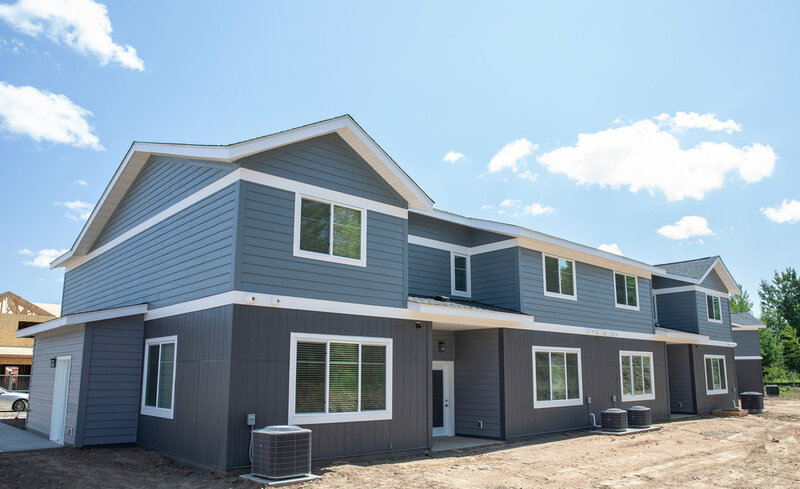 On December 31, 2018, Mille Lacs Corporate Ventures (MLCV) certified and leased 28 townhome units in its first LIHTC project. Lady Luck Estates is located in Hinckley, Minnesota. Within a mere 2 mile radius from Lady Luck Estates sits Grand Casino Hinckley, Grindstone Laundry, the Grand Northern Inn, the Grand Hinckley Inn, and the Grand Hinckley RV resort – all subsidiaries of MLCV with dozens of fulltime job openings. MLCV designed Lady Luck Estates to be a sustainable business, but it invested in the project to provide workforce housing and to invest in the local community. The average employee in the Hinckley area drives about 30-50 miles to work one-way; spending about an hour and a half in the car each day. This commute creates a terrible strain on the budgets of frontline employees. Reducing daily drive-time from an hour and a half to ten minutes saves substantial money on gas and wear and tear on vehicles. It also allows employees to spend more time with their families and contributing to their community. Attracting 28 families to the City of Hinckley provides a meaningful lift to local grocery stores, restaurants, auto repair shops, retail, and other businesses. It will also increase the local tax base through sales taxes and property taxes. Most importantly, meeting the affordable housing demand in the area will provide the foundation for future economic development and a vibrant local economy. Increasing the affordable housing supply can be the proverbial rising tide that raises all ships. LIHTC projects are challenging. The rent and income restrictions keep compliance costs high and operating margins thin. Moreover, LIHTC allocations are extremely competitive. Applications are scored by the Minnesota Housing Finance Agency (MHFA). The MHFA’s scoring rubric rewards access to public transportation and walkability to local amenities, which challenges more rural projects. The MHFA denied MLCV’s first application for Lady Luck Estates. MLCV reworked its application to provide more rental assistance and services to low-income tenants. While this change increased the points of Lady Luck Estates’ application, it decreased the property’s operating margins. Local support has become vital to receiving LIHTC allocations. A local municipality’s willingness to contribute land, infrastructure, Tax Increment Financing, temporary tax abatement, permit fee waivers, zoning variances, or any combination thereof, will significantly improve the scoring of an application. It will also contribute to the overall viability of the project. In the current LIHTC landscape, it’s almost impossible to receive an allocation on a viable project without strong community support. Municipalities are understandably cautious about using their resources on these types of developments. Constituents may be wary of seeing their tax dollars being used as a “corporate subsidy.” Employers should invest time early in the planning process to address community concerns. Financial transparency is important to earning the public’s trust. Employers can show that they have a vested interest in the community and are not trying to get rich off public support. However, the community may need to see the financial models for the project to truly believe and buy-in to the big picture. Unfortunately, LIHTC allocations are limited and only deploy once a year. LIHTC projects alone will not satisfy the demand for affordable housing. Fortunately, Opportunity Zones could provide a solution. The 2018 Federal tax law created Opportunity Zones, in which Opportunity Zone Funds could invest returns that are subject to capital gains taxes, and defer those taxes until 2026. Any appreciation of that investment would be exempt from capital gains taxes, so long as the capital remained invested for a period of at least ten years. MLCV worked diligently with multiple governments and organizations to successfully designate five Opportunity Zones across Aitkin, Mille Lacs, and Pine counties. Hopefully, these incentives can be combined to overcome the low yields typically seen with affordable housing developments. Partnering with employers, such as MLCV, on affordable housing in Opportunity Zones could be enticing to high net worth investors for several reasons. First, the ability to defer current capital gains taxes until 2026 will result in a substantial Net Present Value windfall for the investor. Second, the current demand for affordable housing ensures high occupancy rates for the foreseeable future. Couple this with partnering with a strong employer that has a vested interest in the community, and the investment becomes relatively safe. Third, an affordable housing development provides the investor with an opportunity to impact the community in an extremely positive way. Such projects would not constitute charitable giving, but the investor can make a difference while making also a sound financial decision. Finally, the cash-on-cash returns, although modest, will not be subject to capital gains taxes. To attract investors to affordable housing developments in Opportunity Zones, employers will need public support. Most newly constructed housing complexes require exorbitant rents to stay afloat. These types of projects will not have the benefit of LIHTC financing, nor will employers be able to command high rents and provide workforce housing at the same time. Workforce housing projects will not support substantial debt services. Therefore, a municipality’s willingness to contribute the same resources described for LIHTC projects is necessary to prove to investors that an affordable housing development is attractive. Although LIHTC projects can be challenging and Opportunity Zones still lack complete clarity, MLCV will aggressively pursue affordable housing developments on both fronts. The housing and labor challenges in the region are too severe to ignore. Employers who invest in their communities with affordable housing are investing in their own long-term health as a company. On the issue of housing, the interests of the private and public sectors have aligned. To be successful, employers need strong partnerships with the public sector to bring these projects to fruition. Zach is responsible for developing MLCV’s identified core capabilities and overseeing the execution of key business priorities.